In a fabled land called Silicon Valley lies a species of men, largely single, who have dedicated themselves to the art of self-improvement and longevity. This single-minded pursuit, bordering on obsession, was epitomized by author Tim Ferriss, who plays to this cult of skill building and performance enhancement on his popular podcast, The Tim Ferriss Show. It is therefore fitting that I first heard of Wim Hof on this podcast. The fantasy draws from the yogis of yore who could sit on ice and meditate for hours without dying of hypothermia. Wim Hof is famous because he advocates ice baths and standing bare-bodied in freezing alpine cold. The holy grail of most endurance athletes is adaptability. How to make your body adaptable to heat, cold, triathlons, marathons, or for most of us, merely climbing six flights of stairs? Different fitness gurus have different approaches. Kelly Starrett, who makes a very good living by advising corporate clients on performance and fitness, advocates stand-up desks. Hof suggests ice baths and breathing exercises. The product is the man himself. 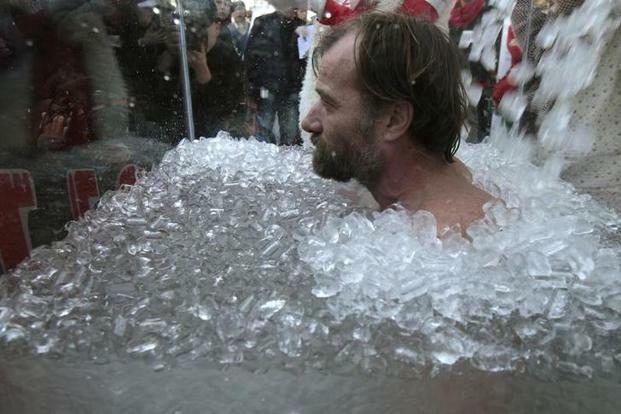 Wim Hof, born in 1959, is characterized as a Dutch “daredevil”, for his ability to withstand extreme cold. He does this through three seemingly simple things, all of which have something in common with yoga and breathing techniques (although Hof himself attributes his inspiration to Tibetan Tummo or inner fire meditation, where monks raise their body temperature by as much as 17 degrees in the cold. This is done for 30 cycles or rounds. From the 31st time, you breathe in and hold your breath for longer and longer periods, starting with a minute. After holding your breath for a minute, you exhale and also hold your breath, i.e., without inhaling again. This is broadly similar to the bhastrika technique taught in Indian pranayama. It causes head-tingling sensations, a rapid heartbeat, and a sense of hyperventilation. Hof claims that doing this type of breathing makes the blood alkaline and triggers a flow of epinephrine or adrenaline—the hormone that triggers the fight-or-flight response. This increased metabolic activity can cause even lazy, biryani-stuffing gluttons like me to do something radical like push-ups. These breathing techniques are detailed in his video course, available through his website. In it, Hof walks people through his breathing and ice bath techniques in his sing-song voice, frequent laughs, and a manner that doesn’t take itself too seriously. “The blood should flow into your head so that it feels like you are about to take a good s@#t,” he says. He plays the guitar as participants meditate and his beautiful golden labrador is the supporting actor in all videos. Folksy manner notwithstanding, Hof is no charlatan. He works with doctors and scientists across the world so that his body and methods can be subjected to study. A March 2014 study published in the Proceedings of the National Academy of Sciences in the US suggests that Hof’s method of consciously hyperventilating has far-reaching benefits. Inflammation is the new buzzword, with countless Westerners guzzling turmeric so that it will prevent inflammation. Hof dunks himself into ice baths. His Silicon Valley acolytes, including Tim Ferriss, also swear by ice baths. That may be a bit much, but the breathing techniques, if nothing else, will raise your metabolism and cause you to shed a few pounds. The Wim Hof method video course is available for download or online streaming here. It includes group lessons on breathing, yoga, stretches, and one-on-one coaching by Wim Hof on how to breathe and increase your blood alkaline levels. The course costs $297. Ice baths have become a thing now, practiced by various Hof acolytes in Europe and North America. Whether or not immersing yourself into ice cubes catches your fancy, it is hard to discount the power of 30 inhalations or, for that matter, holding your breath so that your body can get “flooded” with adrenaline, thus making it alkaline, as Hof says. Breath, do push-ups, stand in freezing water, immerse yourself in an ice bath. Repeat. Hey, that’s not so bad.